This piece was built around a thrift store decorative lantern. The original metal was covered with colorfully painted tile adhesive and illuminated with LEDs. 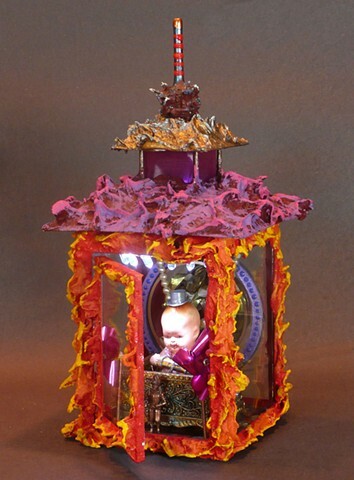 They focus on a small baby doll sitting in a metal box, surrounded by decor and wearing a tin top hat game piece from a vintage monopoly set. Seems like something you should get important advice from.